WhatsApp started providing digital payment features in its short message service. With the title “WhatsApp Payments”, the feature is currently newly tested in India for users joining the beta program. Rumors about WhatsApp Payments has been in circulation since last January. Appropriate source leaked in, WhatsApp is said to be releasing digital payment feature in this February. The WhatsApp Payments mechanism uses a Unified Payments Interface (UPI) system. The payment interface facilitates cross-bank transactions in India, some of which are State Bank of India, ICICI Bank, HDFC Bank, and Axis Bank. 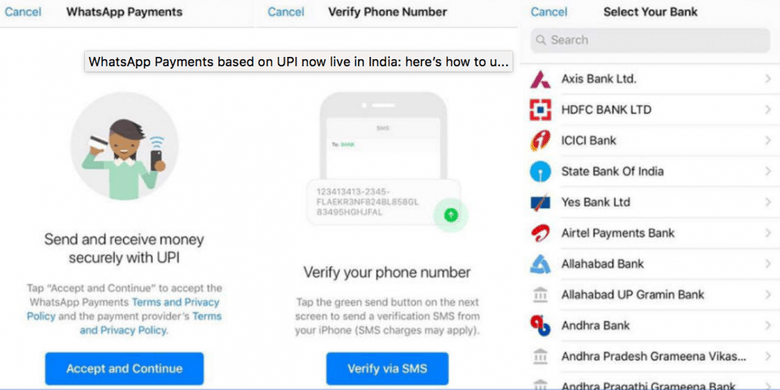 Permission to use UPI obtained WhatsApp from the Government of India since last July 2017. The development process for about half a year finally paid off. Temporary use of WhatsApp Payments is limited to inter-user money transactions, aka peer-to-peer. Users can not make transactions to third party merchants. So how to transact with WhatsApp Payments? First of all, two users who want to transact must join the beta program and install the latest version of WhatsApp for iOS or Android. To send money, users simply press the attachment icon that is also clicked when they want to send contacts, media, locations, etc. Users will find the payments option as collected from Digit.in. Select the contact you want to send money to, select your bank account and the recipient, enter the money amount, input pin UPI, then your money will be sent virtually. WhatsApp Payments supports transactions to over 70 banks in India. When the first transaction, the user will be asked to verify the mobile number. Make sure the mobile number to access WhatsApp matches the mobile number linked to the user’s bank account via UPI. If you do not have an UPI account, WhatsApp Payments has the option to create a new UPI account. All your transactions will be recorded in the option history in WhatsApp Payments. Since it is still in beta form, this feature may be further developed for more functions when it is unveiled publicly. Not yet clear when WhatsApp Payments is available in other countries, including Indonesia. Let’s wait. Previous articleComparing Google Maps with Waze, Which is Better?